Apples, it seems, have been around for quite a while. After all, it was an apple that some say got humanity off to a bad start. 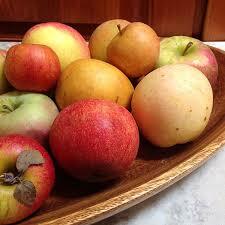 The apple originated in Turkey and is thought to be the earliest fruit tree to be cultivated. Today there are some 7,500 varieties grown around the world, and 2,500 in the United States. You can usually find five varieties (or less) at your local grocer; fewer if you’re looking for an organic variety. Farmers’ markets often provide a wider selection, including heirloom varieties that have fallen out of favor with commercial growers. But no matter what your favorite variety is, how it was grown and where you buy it have taste and health implications. Let’s start with the commercial non-organic apple. It has more pesticide residue on it than any other fruit or vegetable. According to an analysis of USDA data, pesticides were present on 98 percent of the more than 700 apple samples tested after they were washed. In fact, the apples were found to have more than 40 different kinds of pesticides on them including paraquat, which is linked to the development of Parkinson’s; organophosphates, poisons that damages an enzyme that is critical for controlling nerve signals in the body; and Chlorpyrifos, a chemical linked to lowered IQ and higher incidence of ADHD in children. Organically grown apples have no pesticides. Period. What they do have is better taste (admittedly a subjective judgement); 15 percent more antioxidants in the skin; and are naturally low-in-sugar and high in fiber, which keeps you fuller longer. And now we come to the apples you can find at your local farmers market – apples that were probably on a tree the day before. They are fresher, which always tastes better (and that’s not a subjective judgement). They have no pesticide residue, assuming your farmer grows organically (just ask him or her or check with the market manager to be sure). 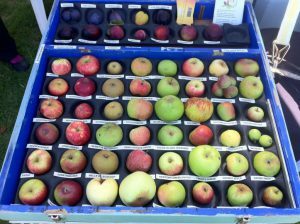 And you will probably find varieties you won’t see at the grocery store, like Thoday’s Quarrenden apple; the Westfield Seek-No-Further; the Black Oxford which looks more like a plum; the red-streaked Wolf River; and the russet-style Zabergau Reinette apple, which tastes of nettles when straight from the tree. You won’t find them in your grocers because the demands of industrial agriculture pushed the apple industry to settle on a few varieties, letting the rest slide into oblivion. But since apple trees can live for more 100 years, these heirloom varieties can still be found. You just have to look for them. You’re in for a healthier, tastier bite if you do.